One of the best ways to save money is by using something you can get for free -- rain! 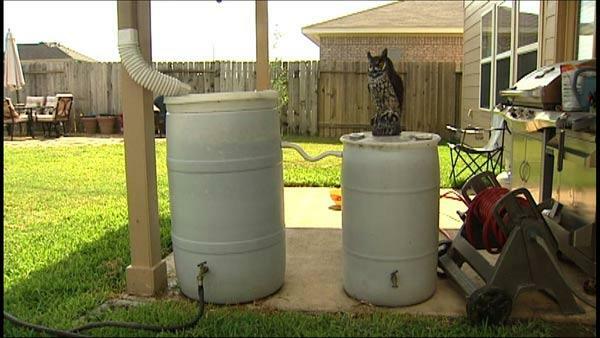 Having a rain barrel at your home can really cut down on your water bill, and it's easy to make. 'Super Saver' Erin Libranda has one, and she did it herself in about an hour. "It's a simple concept, simple to do and the materials are readily available -- and anybody can do it," says Erin. First, figure out where you will put the rain barrels in your yard. For Erin, the best location is next to her downspout on her backyard patio. "Every time it rains the barrels fill up and it saves on the water bill," says Erin. All you need for this project is a barrel or large container, a tube that funnels the rain to the barrel and a spigot to get the water out. Hardware stores will sale rain barrel kits but they are pretty pricey. We found a kit for $98! Erin's way is *way* cheaper. "I made two of them for less than $25," says Erin. When it comes to the "rain barrel" get creative. Erin found her barrels from an old soda bottling plant. But, you can also use a plastic garbage can. Large, sturdy garbage cans from the hardware store are about $40. "You can pick them up anywhere," says Erin. "You want to make sure they are "food grade" though because if you are putting it on your vegetable garden or something you want to eat off of it, you don't want chemicals." The next key to this project -- getting the rain to go from the roof, and into your barrel. We found a "downspout" at the hardware store for about $8. Or, you can just cut the downspout you already have. "I cut the initial downspout that was already here and put this adaptor on, so the adaptor is bendable, so it goes right into the rain barrel itself. So when it rains the water goes in here," says Erin. "To get the water out I put spigots at the bottom of both of them, so what I can do is attach the hose, turn it on take it to wherever I want to water." There are a lot of options with it comes to spigots. We found one for $5. Just make sure it has a screw bottom so you can attach a hose. Erin says one good downpour fills up both of her barrels, and it can be used to water the yard two or three times! Put a screen over the vent to prevent mosquitoes from breeding in your barrel. Consider joining multiple barrels for additional water storage! Elevate your barrel slightly to make it easier to get to the spigot. If you put moss killer on the roof unhook the rain barrel for a few rainfall events before collecting the roof runoff. We could all use a little extra cash. Getting it can be as easy as turning one person's trash into another person's treasure. You may not think about it now, but a lot of the items you buy end up getting tossed in the trash. It's like literally throwing your money away. You don't have to spend a ton of money on your makeup! Professional makeup artist Steven Coleman has a lot of drug store makeup in his arsenal.